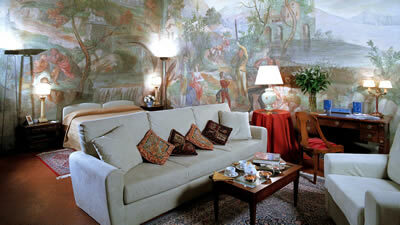 Just occasionally, I tire of grand hotels, and seek instead the comfort of a friendly palace. Thus did I find myself, not far from the River Arno and the Ponte Vecchio in Florence, walking off the street into the grand entrance hall of the Palazzo Magnani Feroni. Originally built in the 16th Century, and much expanded by the Marquis Feroni around 1770, this handsome pile passed into the Magnani family in the Nineteenth Century. And now, I am pleased to report, it offers accommodation to those of us who like to be surrounded by columns and fine works of art. The members of staff I encountered were friendly and helpful, and I was soon unpacking the Globetrotters in the charming Suite Lucretia. This was on the ground floor, which suited me well – although there is an exquisite little lift, which goes up as far as the second floor and contains a pretty velvet sofa. Twelve suites are available and prices begin at around 300€/400€ a night for two people with breakfast (and, of course, are rather more for a large suite), and need to be checked on the website for specific dates. I like lots of space, and here I had it. The ceilings were high and vaulted. French windows gave onto an internal courtyard. Lights – both of the wall and table sort – were numerous. The sitting room easily accommodated its sofa and two easy chairs, as did the bedroom its handsome antique wardrobe of highly polished wood. The air conditioning was controllable and effective. The bathroom – as so often in ancient buildings, for understandable reasons – was of more modest dimensions. It was clad with tiles of brown and cream. Altogether, this was a very pleasing billet. The Breakfast Room was pleasing, too, for it enabled me to tuck into the comestibles from the buffet table while sitting under an impressive chandelier of Murano crystal, which originally illuminated the Palazzo Farnese in Rome. I mentioned that the lift will take you up to the second floor. 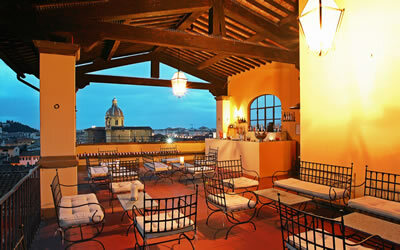 The terrace with its bar is above this level. Indeed, it is quite a long way above this level. As I heaved myself up the (numerous) steps, I wondered whether the effort for an elderly gentleman like myself was worth it. It was. The view over the city from this loggia is lovely, and takes in the dome of the Duomo as well as the tower of the Palazzo Vecchio. The bar does not open until six o’clock in the evening, but the telephone on the counter enabled me to summon a pot of Earl Grey for the afternoon ritual. I sat upon cushions on one of the wrought iron sofas, sipped my tea and thought that it was a joy to contemplate the cradle of the Renaissance from such a privileged vantage point. 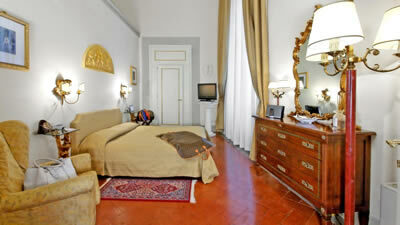 The Palazzo Magnani Feroni offers splendid rooms in an excellent location. 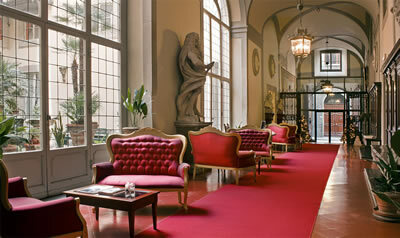 For those who like the idea of a friendly palace in the heart of Florence, it is ideal. 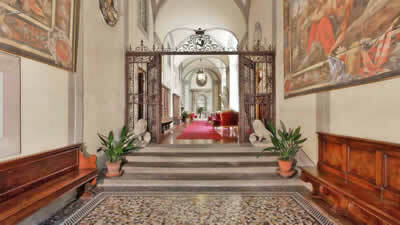 Borgo San Frediano 5, 50124 Florence, Italy.